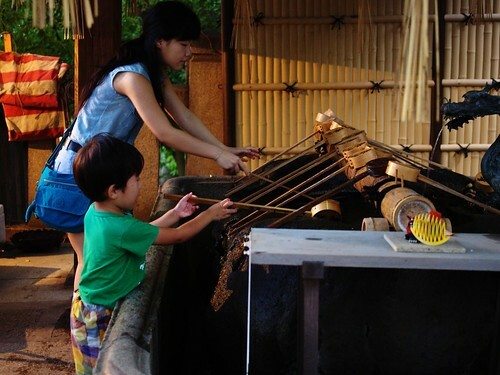 Every summer Kouzu Jinja, "our" neighbourhood shrine, holds a festival. It's fun, so we try to go when we can. I've been there five or six times now, and Ritsuko has of course come here since she was a child. You can go there during the day, but the place really gets going after dark, when people join the festival after work together with their families. When you enter the shrine area you're supposed to purify yourself by washing your hands in a fount outside. Frankly, most people don't bother during the festival. This boy seemed to find it endlessly amusing, though. 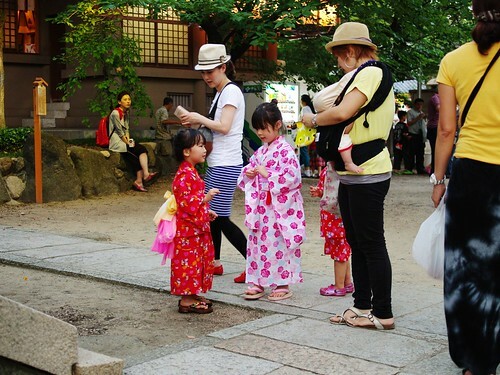 Many young girls dress in summer yukata during festival, which adds to the festival atmosphere. Some men dress in yukata or samue, although it's much less common. I wore a samue this year, and it's really perfect in this climate. The loose, rough-woven cloth is cool and airy in the summer heat. More people should try it. Summer festivals are for the children as much as for the adults. 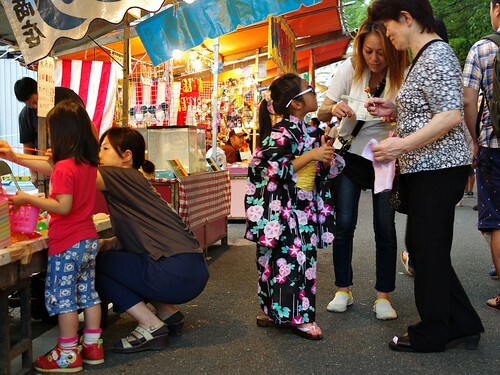 Kids run around in the shrine area, and the street outside is lined with carnival games, candy, drinks and snack food. A summer festival is not complete without food and drink. 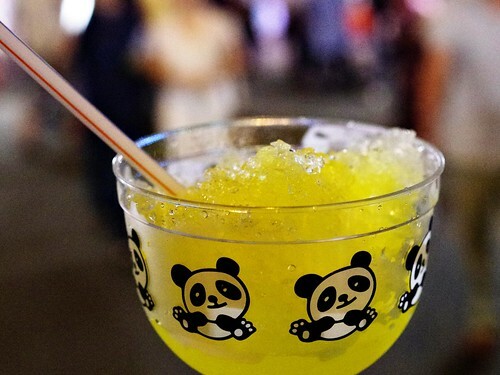 Shaved ice with syrup is a favourite. 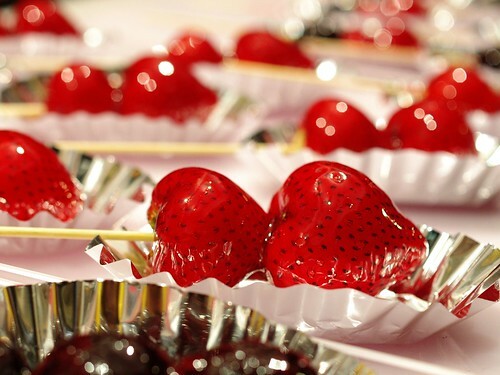 Candied fruit is another great reason to come. Crunchy on the outside, sweet and juicy inside. Just be careful; the hard, sticky candy can easily ruin your teeth. Festivals are usually sponsored by local companies. 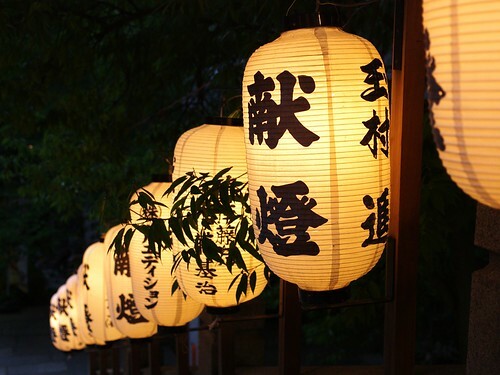 And those that become sponsors get a lantern with their name on it hanging along the walkways and stairs. Advertise in style. Did you know there's olive groves in Osaka? Neither did I. A few weeks ago, Ritsuko found fresh olives at a local farmers market and bought a small bag on a whim. Olives are pretty much inedible when fresh, so you have to pickle them in brine. There's lots of recipes on the net, and they all vary quite a lot. That's a good thing; it usually means that the details don't really matter too much. Fresh olives are very bitter, so first you need to soak them to remove that flavour. We cut the olives in top and bottom and put them in a jar. We poured a brine of 1 part salt to 8 parts water (by weight) in the jar, then used a small glass lid as a weight to keep the olives below the surface. Our olives just after the second pickling. It's been two weeks now, and the olives have turned a muted olive green and the brine has turned brown. We strained the olives and washed them in fresh water. The bitterness is gone and there's a faint but definite olive flavour. But they're still kind of raw and crunchy, so we put them back in a clean jar, mixed another batch of brine and added two halved cloves of garlic and one sliced dried chili. Top up with olive oil as a "lid" to avoid contact with air, then put the jar back in the closet again. The major worry is that they will spoil. If they don't, they should be edible in about two months or so, just in time for the year-end holidays. I'm looking forward to trying them. 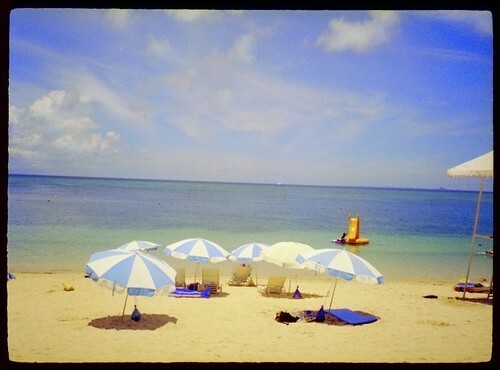 I've finished the film pictures we took in Okinawa earlier this year. 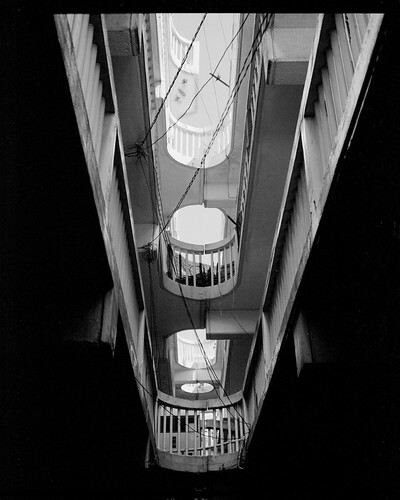 The black and white pictures are from my Fuji GF670, a fully modern medium-format rangefinder camera. A storm is approaching. 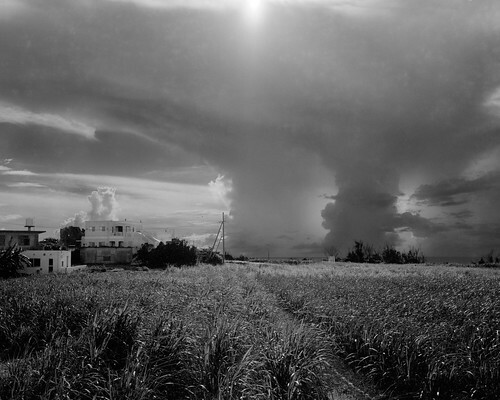 Tancha, Okinawa. The colour shots are with Ritsuko's Canon Demi. It's a half-frame 35mm camera — it takes two vertical pictures in the space of one horizontal 35mm shot — from the late 1960's. Yes, it's older than me, and I'm not exactly fresh out of the box any more. The half-frame format was popular when colour film was new and still very expensive, as you can get 72 pictures on a single roll. The Demi has a light meter but no range finder. You simply dial in the lens to the distance you want, guided by small symbols ranging from a head (for close-ups), to a person, to a group of people, to a mountain. It's not very exact, but more than good enough for a semi-wide lens like this one. 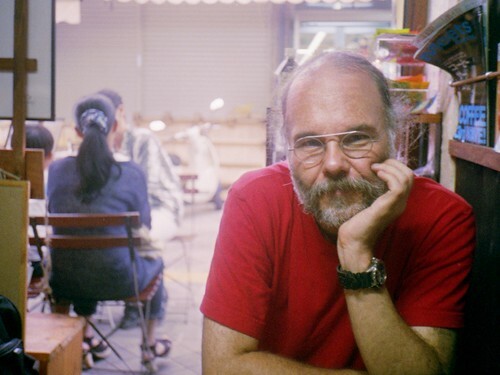 The high-end Rollei 35S works the same and manages to take excellent pictures. The Demi lens has plenty of distortion and is prone to glare, and the small-size images lack fine detail, but all that just adds to the retro appeal of the finished images. And with 72 shots to a roll you can shoot on a whim and not worry about wasting film. There's two quirks to be aware of with this camera: First, the camera shoots in portrait orientation, so you'll end up holding the camera vertically a lot. Also, the light meter cells degrade over time. You really need some sort of cover or lid for the meter around the lens when you're not using it. There is no manual mode at all; if the meter stops working, then so does the camera. 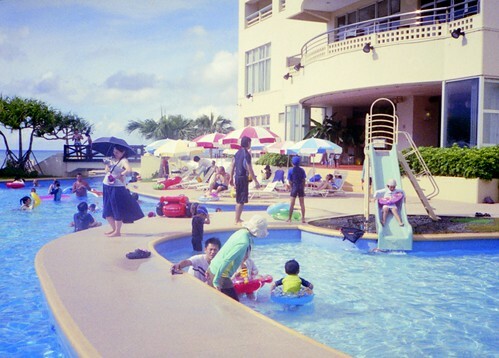 As I wrote in an earlier post, we spent a couple of days at Rizzan, a nearby family resort hotel. We felt very touristy and relaxed, exactly what I needed after an intensive month of work. Poolside at the Rizzan hotel. It's all very family-friendly, and that makes for a lively atmosphere without party crowds. As you can see if you check the larger size, there isn't all that much detail in this picture. 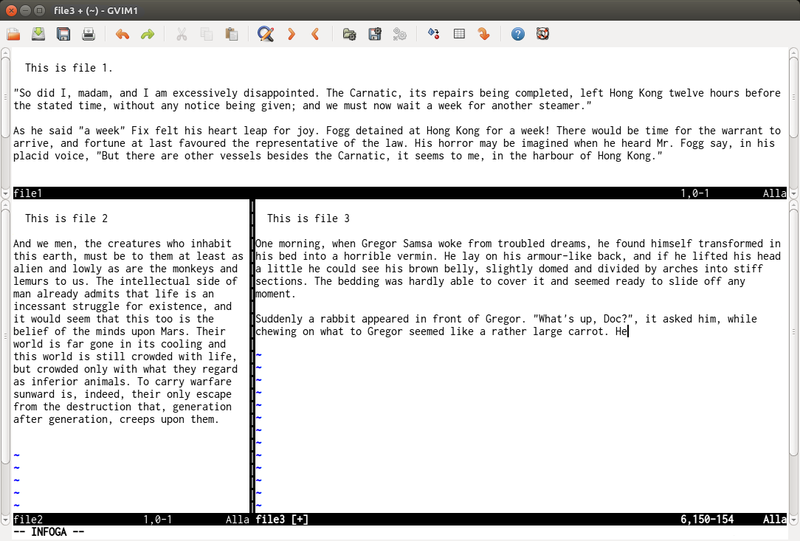 But it's plenty enough for a blog post like this, and it looks really good in a small-sized print. Beach Life. 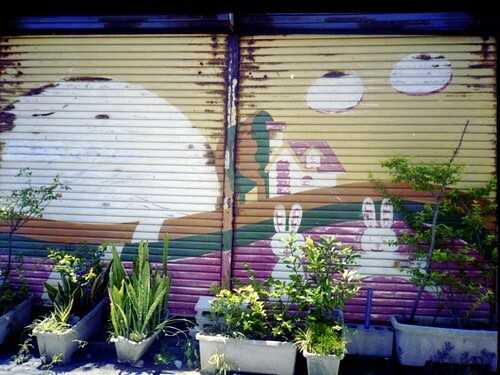 This is what happens if you set the wrong film speed and have to correct the image afterwards. I deliberately left the frame edges; it adds to the old-timey feel, I think. We spent our last day in Naha. Our flight home did not leave until evening, so we deliberately left in early morning in order to get a full day walking around town. Naha is a pleasant, somewhat sleepy town with more than a little south-Asian vibe to it. 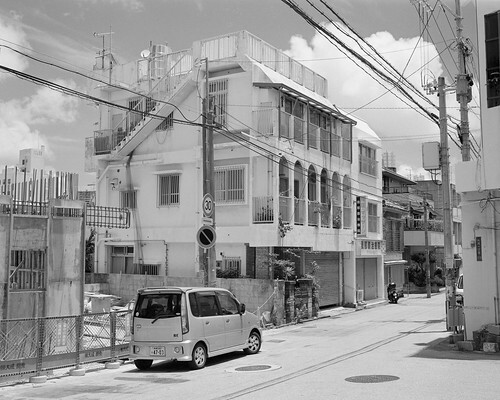 A lot of Naha is like this, with quiet streets bathed in sunlight. It's probably a pretty good place to live in many ways. I wouldn't mind trying it for a few years. Kokusai street is a popular area for sightseers, but it's honestly a pure tourist trap now; rows of near-identical souvenir shops and little else. Stay away from that street and try the side streets, the market or other nearby areas instead. It's much more fun. 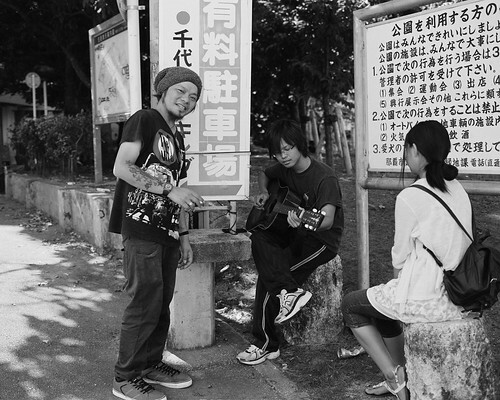 Some people hang out in the shade of a local park just off the end of Kokusai street. It seems pleasant enough, although I'm happy I'm old enough not to have to do this any longer. Many buildings are brightly painted or decorated. It fits the warm, sunny climate, and adds to the distinct Asian atmosphere. 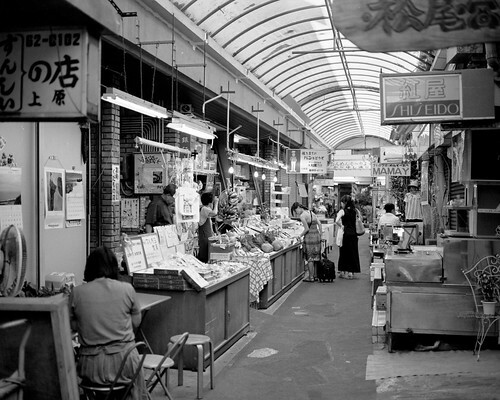 Makishi market is right next to Kokusai street, an area of small covered alleyways centered around a fish market. Again, the atmosphere feels southeast Asian as much as Japanese. The rear side is not very crowded; it's a pleasant place to walk around in especially around midday when the heat and the sun is strongest. A fruit stall at Makishi market. 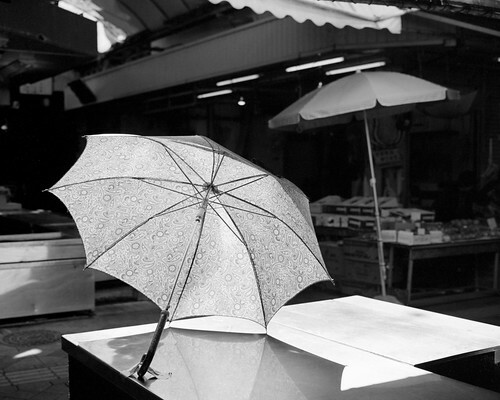 Umbrellas are used for protection against the sun as much as rain. Makishi market. We're having a coffee at "The Coffee Stand", a tiny, tiny coffee place at the rear of the market. This has to be the best coffee place I've found in Okinawa so far. The owner is a true enthusiast - you can select from any number of single-source beans from around the world, then pick the way you want it made, including drip, french press, aeropress and espresso. The magazine rack is full of coffee speciality magazines. It's a great place to enjoy a seriously good cup of coffee. Fish at the market. 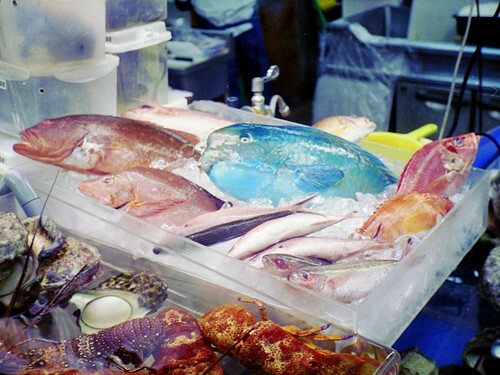 Tropical seas may not always give you the best-tasting seafood, but it does give you the most colourful. 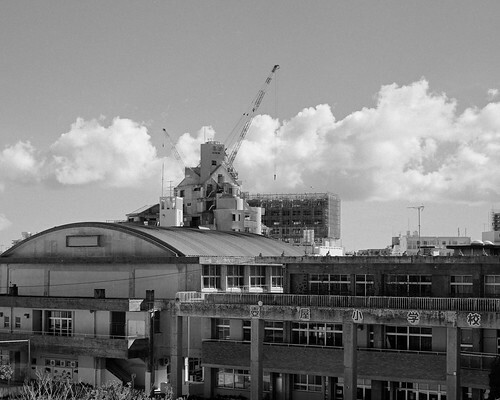 Mysterious structure behind a school in Naha. A little Hayao Miyazaki-like. Or perhaps it's just the angle. Lunar eclipse in Japan tonight. As I walked home along Nagahori street in the cool autumn air, people were standing around, talking, and taking pictures. Some office workers sat on a railing outside Yamaya, our local liquor shop, drinking a beer and watching the eclipse. If you think "Vim splits" may have something to do with a cleaning product then this post might not be for you. Geekery ahead. 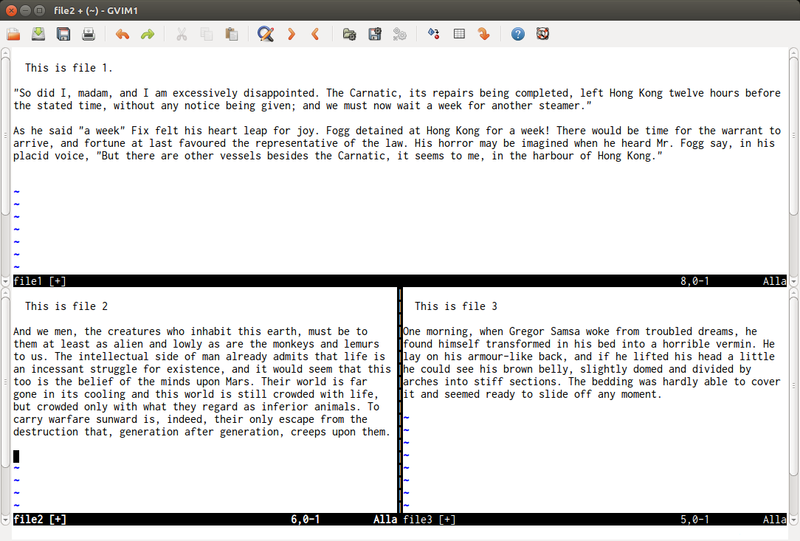 A Vim editor with three splits, each editing a different file. Split windows are very useful. But when you have many splits or when you're on a small laptop screen, each split becomes too small to edit things properly. You can of course resize them in various ways: ctrl-w _ and ctrl-w | will maximize vertically and horizontally; ctrl-w + and -, and < and > will increase and decrease the split size; and ctrl-w = will equalize them all. But that's a hassle; also, when you maximize a split you no longer see the contents of the other ones. Ideally you'd increase the size just enough to edit properly, and do it automatically.
" or 2/3 of the available space otherwise. When you call this (on the command line as :call Splitresize()), it will resize the current split to 2/3 of the entire editor width and height; but always at least 90 columns by 25 rows, and no more than 140 colmuns by 60 rows. That guarantees that the split is always large enough even on small screens, and never becomes ridiculously huge on large screens. right, and it has resized itself to a comfortable size. You can move between splits with ctrl-w h, j, k and l. It's a bother to press ctrl-w all the time, though, so many people add mappings so ctrl-h, j, k and l move between splits directly. These mappings add :call Splitresize() to the end, so your splits will resize automatically when you move to them. And you can still use the ctrl-w hjkl mappings or select a split with the mouse when you don't want the split to resize. If you use Vim then give this a try. And if you have any feedback or ideas to improve this then please get in touch. Much as I enjoy doing science, it's a real pain to sort through piles and piles of research papers for the information I need. Papers are strictly organized and ruthlessly trimmed to make it as quick as possible to find what you want, but it still takes a lot of time when there's hundreds and hundreds of them to go through. Each paper yields just one or two scraps of relevant information; information that is often incomplete or contradicts that of other papers. Half the time you can't even judge if the data will be relevant to your work. There's nothing surprising about this, of course. The low-hanging fruit ("neurons use electro-chemical signals! ", "the eye is a lens!") have long since been picked, and it takes a lot of time, ingenuity and effort to tease out even a few new scraps of knowledge in detail. Most papers present only a few small new findings because that's all a year or more of work will yield. But it means any search for background information is a long, slow struggle. And it never ends; there's always more to find if you look. 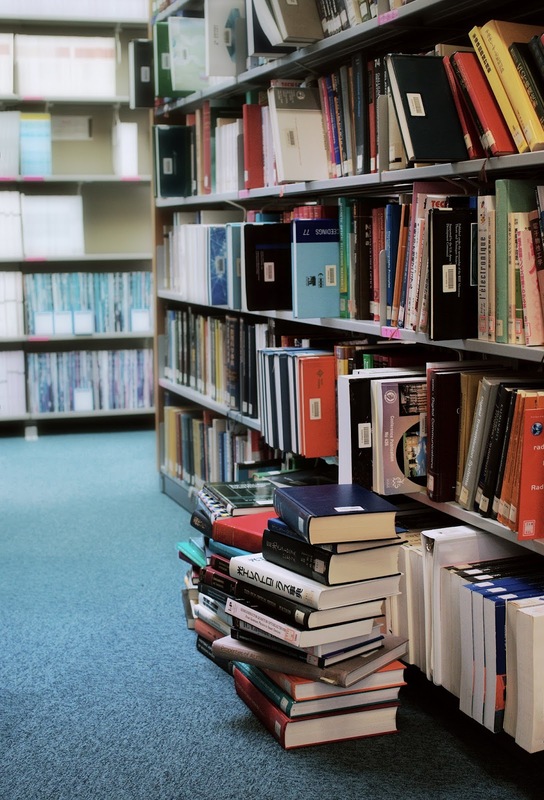 More than a few graduate students get caught in this trap: they think they need all the background before they do their own work, then get stuck in an endless loop of literature searches with no results of their own to show as their grad school clock runs down. Enter the review paper. That's a paper where a researcher collates, summarizes and interprets all the recent literature on a topic. It can run to dozens of pages and contain hundreds of references. It summarizes the current state of knowledge, and is a great one-stop source for all the major papers. A good review paper also highlights areas of disagreement and areas we don't know enough about. Some people criticise review papers. They tend to get a lot of citations, often more than the original papers, even though the author often hasn't done much or any of the work it presents. But I say review paper authors are if anything receiving too little credit, not too much. It truly is a monumental struggle to go through and synthesize all that material. A well-written review paper is a tremendous service to the field, a time saver for hundreds of other people, and a great way to make clear what we do and do not actually know. The more we have of them the better.